Suppose you've already installed Flow-Flow App from Shopify Appstore. Let’s navigate to the Flow-Flow admin panel and setup our first stream. Some social networks require auth keys for (sic!) your website before you can pull any content from there. At the time of this writing, authentication is necessary for Facebook, Twitter, Instagram, and Google+. If you want to stream content from any of these networks you need to setup it accordingly to specific network terms. These settings must be stored under Auth tab. We strongly recommend beginning with this step. 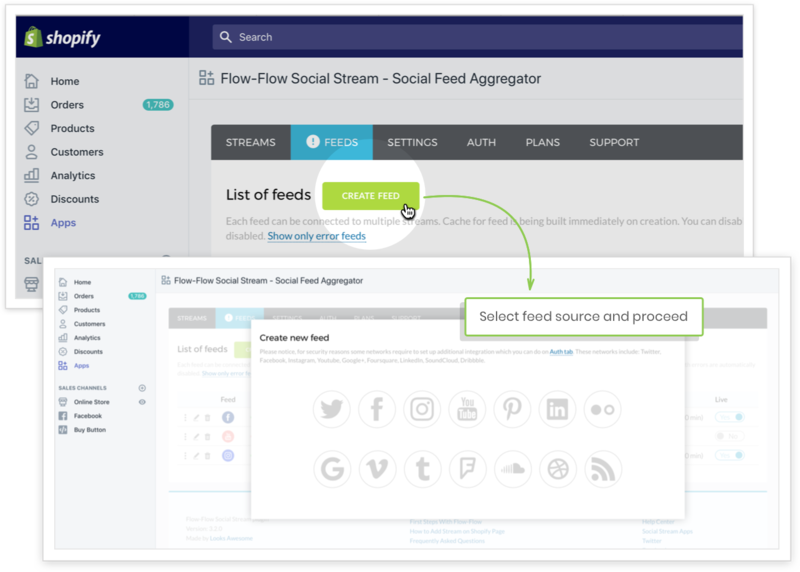 Open Flow-Flow settings page and click Feeds tab. Click Create Feed button and select feeds source. Configure feed accordingly to simple rules described with visible hints. Don’t ignore them because it’s the part of common mistakes. Go to Streams tab and click Create Stream button. While editing your stream, go to Source tab and click +Connect feed to stream button. Associate 1 or more previously added feeds with your stream. From this point, your settings are done if you don’t really need any further customization. Go through all other tabs to design, style and setup your stream. You can save it, then go back to the list and that’s it. Now you see the list with newly created Stream. If you haven't inserted stream on a page yet, please check Installation guide.